Plant sightings is the main focus of wildeherb. Plants native to North America, and especially the Northeastern United States and Pennsylvania, are found, identified, observed and photographed to become part of a living diary about our plant friends, new and old. The weather today is quite brisk with the trees swaying in the wind and making ocean sounds. It is surprising how well the leafless trees do sway in the wind. One would think that there is not much there for the wind to hold on to. Mornings have been in the upper 20s or low 30s and the high temps are struggling to get over 42 degrees. Never mind the wind chill. Scared up a rabbit near the plentiful wild roses by the gravel drive as I took a walk this afternoon. Some of the greenery is starting to re-appear after the long, mild winter. Chives, garlic mustard and cinquefoil were all coming up. Ferns that had been protected by the fallen oak leaves for the winter are starting to get green again. Mosses in the woods and the grass on the lawn look a little brighter green, too. 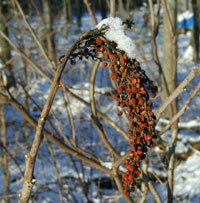 A couple maple trees are just starting to bud out, but no other trees seem to be ready to join them yet. 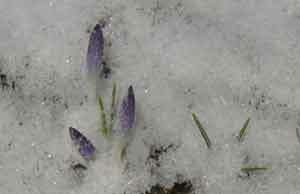 A few hours ago these crocuses were under cover of snow. The sun is warm but the wind is making for a brisk and cold day. The sun has been out long enough between fast-moving clouds to warm up the ground and melt the snow. These little purple crocuses must be the freshest blooms I’ve seen! 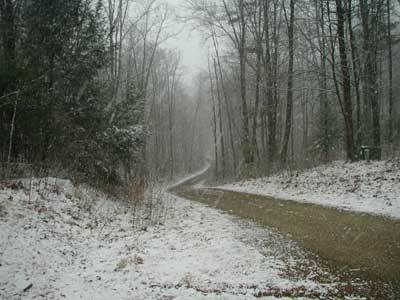 On Monday we had to check the calendar to verify that we were still in Winter as the temperature soared to 75 degrees. This morning is quite another story as gusty winds are whipping the snow around sideways. I wonder if the tulips by the house will survive the last throes of Winter. The tulips adjacent to the house may have been faked out by receiving extra heat, but certainly not the little purple crocuses that are 50 feet or so across the drive. They must be own their own cycle. 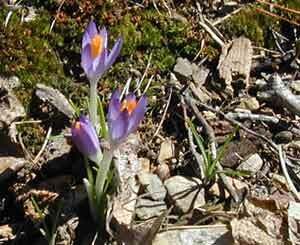 A curiosity — Are plants more likely to respond to the warming trend in Spring or to the lengthening days? Scientists may not even know the real answers because increasing temperatures and longer days are so closely intertwined. The "Ides of March" are upon us! I’ll let the snow squall pass before I venture out today. Even as I write this the clouds have cleared to reveal a blue sky, and yet, stray snowflakes are being whisked around by the winds. 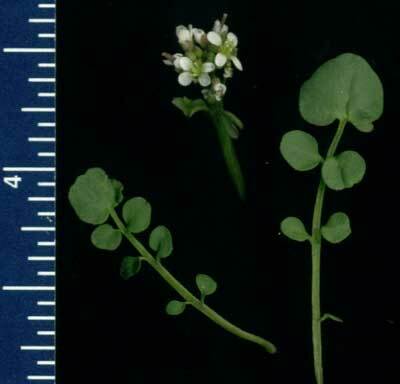 The tiny white, four-petaled flowers of the small-leaved bitter cress were in full bloom yesterday. 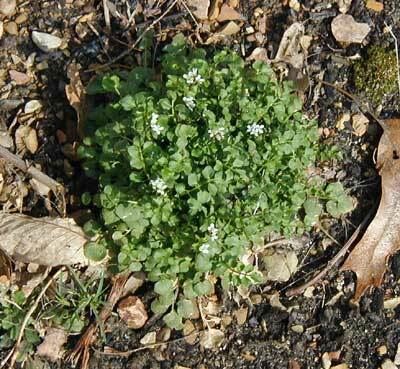 A low-growing plant, this bitter cress is indeed inconspicuous as are its eighth-inch flowers. Describing the leaves is more difficult. What appears to be many pairs of opposite small leaves on a stem is actually a single leaf that is deeply lobed or divided. The leaves alternate up the main stem. 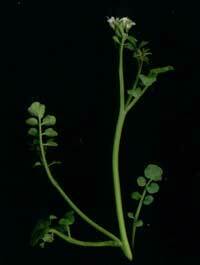 Relatives of the small-flowered bitter cress are said to be good in salads, but this Cardamine species basically tasted like grass.